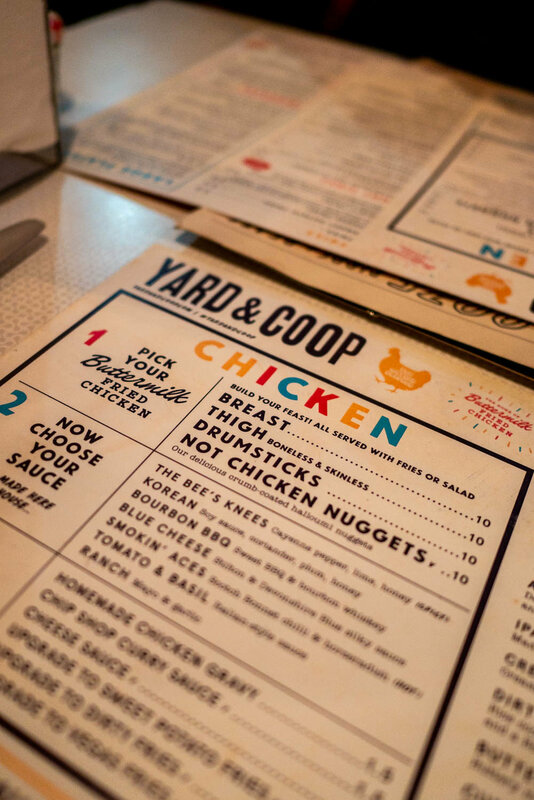 When it comes to fried chicken in Manchester Yard & Coop is hands down the place to go. In true Northern Quarter style the venue is dressed to the nines with an edgy barnyard feel throughout - and if you don't know what that looks like think wooden coop style booths, reclaimed wooden tables, a large centre stage cage housing all the booze and plenty of big bright murals. For a menu that's based on a single concept; their secret recipe buttermilk fried chicken, there's so many options to choose from. 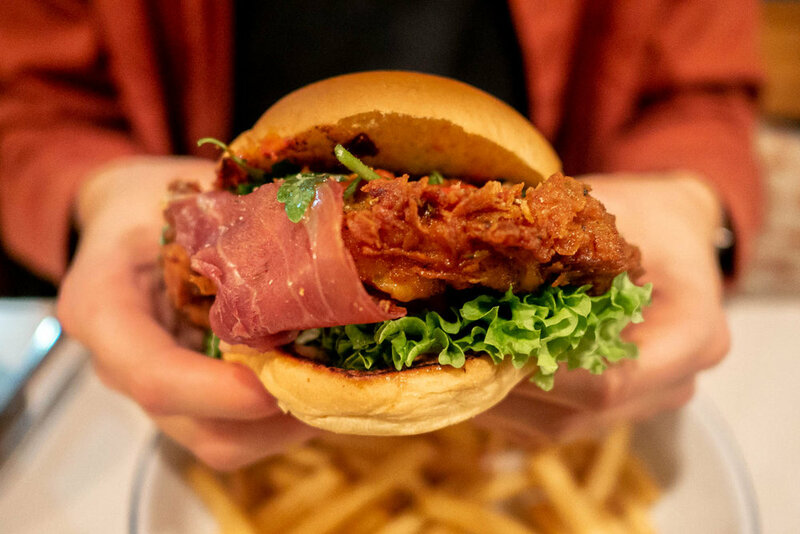 Go completely custom and build your meal selecting your chicken, sauce and pimping your fries or instead pick from their large plates & burgers, remembering to throw a few sides into the mix if you're feeling clucky... Personally we'd really recommend grabbing something from the customised menu, you get exactly what you want (and loads of it!) and the prices are pretty reasonable - we opted for the drumsticks (and 5 big ones at that! ), Korean sauce and curry sauce on the fries all for £11.50 and the nearest equivalent at your local fried chicken establishment would cost you £5 and would be half the size and without the surroundings.. we know where we'd prefer to eat! 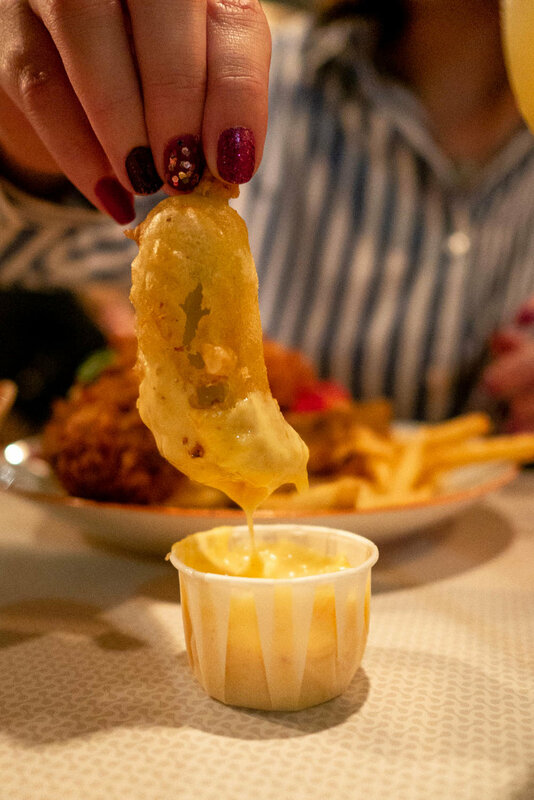 You have to order the battered salty jalapeños that come with a cheese sauce dip, incredibly moreish and will have you wishing you bought more than one serving! You'll be spoilt for choice with the drinks menu if you're into craft beer because their collection of cans, bottles and tap beers is pretty envious for a restaurant. They've got a decent cocktail menu too if beers not your thing.